A farm owner came to Remote Entry Systems with a shopping list of requests for his access control solution. 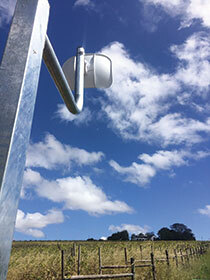 An existing ageing legacy system not only needed to be replaced but, furthermore, the new solution had to integrate with CCTV cameras around the farm. In addition, the owners required intercommunication between the main house and the cottage that it uses as a B&B facility. The new system needed to be capable of allowing communication from the gate to the farm house, a distance of approximately 500 m. The building of new offices added a further element, as the owners required a modern infrastructure and the use of IP technology wherever possible. 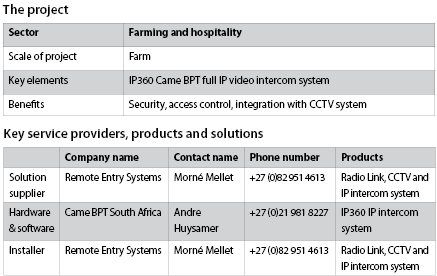 The existing intercom system was inoperable, so instead of searching for different CCTV and intercom systems, Remote Entry Systems decided to install a flexible and integrated solution in collaboration with Came BPT South Africa. Since the distance from the gate to the main farm house is substantial, new cabling would have required extensive trenching, labour and cable costs. However, by deploying an IP solution connected to a radio system, the owners were able to use an IP360 video intercom for identification, integrated with CCTV cameras, thereby allowing the same monitors to be used for surveillance purposes. The solution comprised one IP entry panel, a radio link from the gate to the main house, and a Wi-Fi network covering the main farm house and the cottage. Two Futura IP monitors and four IP cameras are distributed throughout the property and are connected through the Wi-Fi network. The installation was a complete success, ticking all the boxes for the farm owner. The two Futura IP monitors take advantage of the intercom feature embedded in the BPT system, allowing full control of the cottage and improving the service level afforded to cottage guests, who are now able to contact the main house when in need, without actually leaving the cottage.